I’d like to share with you my creative space. This little room is where all, well most, of the creativity happens these day. I call it my Creative Oasis! I haven’t always been so fortunate to have an amazing space to call my own. I only recently moved into this space after our roommate decided it was time to move on to bigger and better things. Before that I contained all of my craftiness to one corner of our guestroom, or at least I tried. It was pretty hard considering how small the room was to begin with. That was before I had my awesome craft room so he just had to deal with it. Now that I have a designated area for all things creative I have no excuse. But it still happens! My usual response: Sorry babe, you can’t control the creative chaos!! 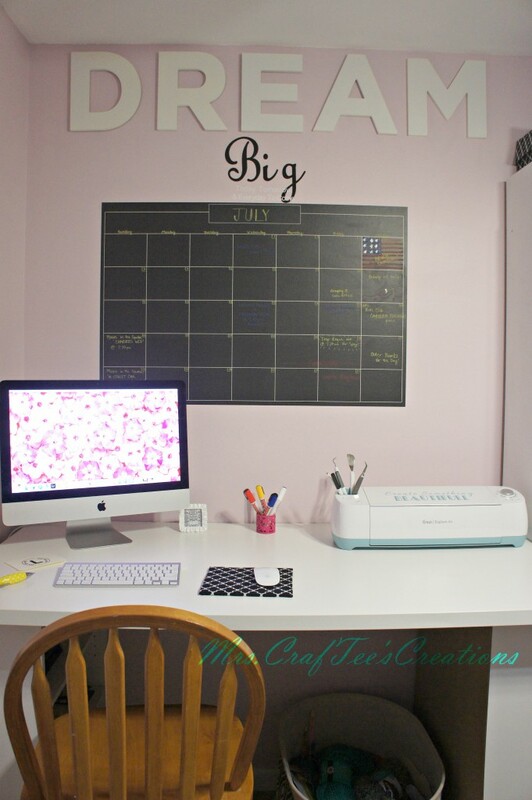 More times than not Creative Chaos is how I refer to my craft room! I’m sure some of you crafty people can relate (I can’t be alone on this one). When I get going there is no stopping me, and certainly no putting things back exactly how I found them! 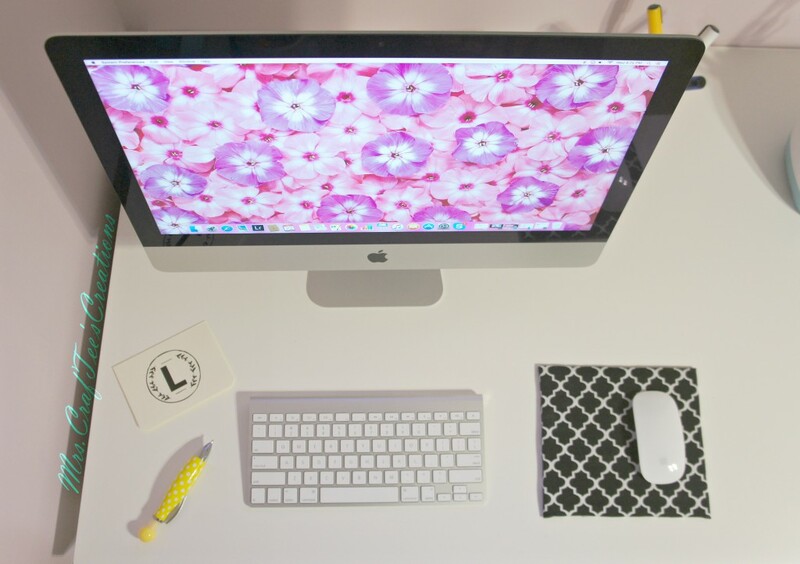 Don’t be fooled by these pictures with everything semi-nice, neat, and organized. Like I mentioned earlier, it will last maybe a day if I’m very careful. So without further ado I present to you, my little slice of creative heaven. 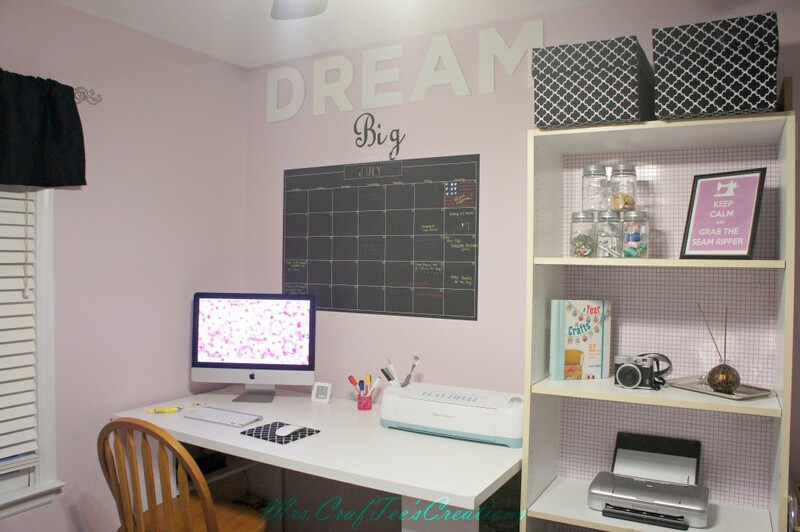 This is where all the brainstorming (AKA Pintrest surfing) and Cricut cutting fun happens. It’s equipped with an awesome brand new desktop, which I am in love with but am still figuring out. We didn’t have a desktop before the craft room came about. It was a fun process test driving all the computers at Best Buy before we both agreed on the iMac. My input on the decision was mostly that it looked really nice, it was fast, and it would work well with my particular software I have for crafting. My husband is the tech geek who researches everything about a product he is interested in beforehand, and will still spend another four hours in the store making the decision! So, I don’t really worry about all the other specs. I know he has us covered. On the other half of the desk sits the most awesome machine in the history of man! Not really, but it’s pretty freaking awesome. The Cricut Explore Air is an electronic die-cutting machine that has some amazing tricks up its sleeve. 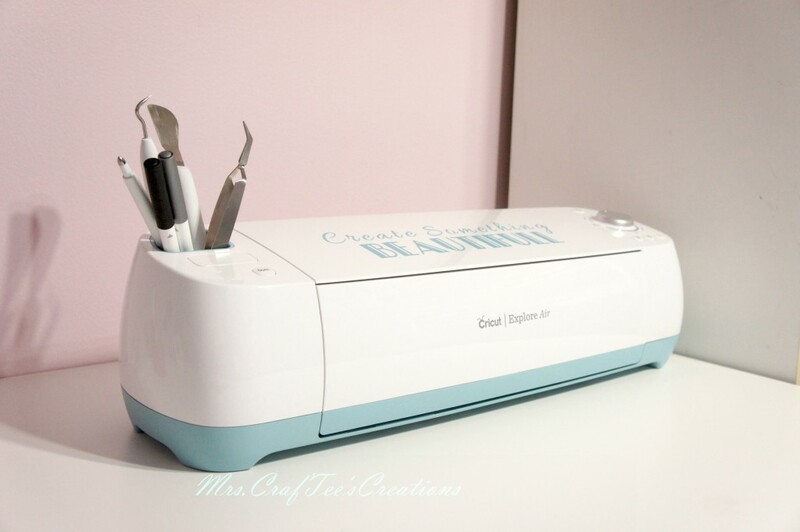 It is one of the latest versions of the Cricut cutting machines and it cuts out just about anything. I’m putting a link to the cutting list here and more information on the machine here. Check it out! If you like doing anything crafty you will fall in love with this machine! This is where the real fun plays out! I get to cut pieces of fabric to bits and put them back together to make something incredible. The desk is actually the perfect size to fit both my OLAF cutting mat on one side and have my Brother Cs-6000i sewing machine alongside it. Easy access to cut then sew! Both desk I have in this room are actually makeshift desk. They are a combination of two 3-shelf bookcases on either end of a $25 Ikea desk top. Thank you again Pinterest for such wonderful money saving ideas! If I haven’t mentioned it yet then, you should know. I LOVE PINTEREST! I’m a bit of a Pinaholic. I think that’s a real condition and if it’s not it needs to be! LOL Most of the things I create, nine times out of ten, I saw it on Pinterst. 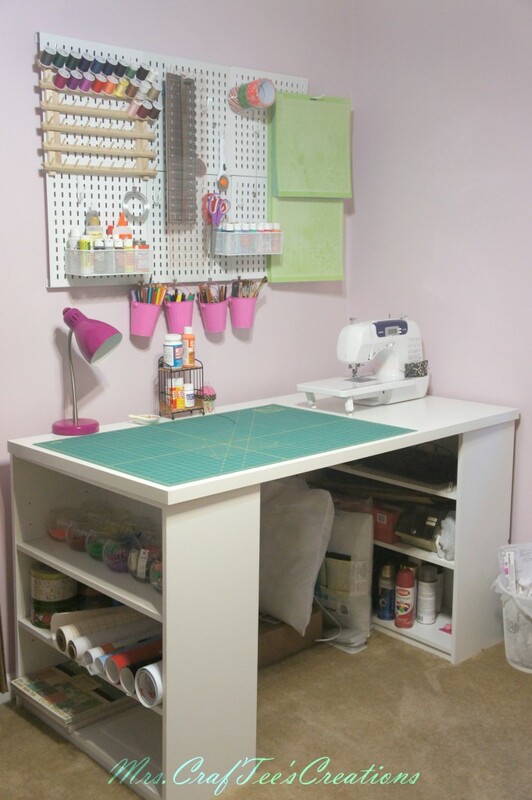 Above the cutting/sewing table is my pegboard that houses all kinds of things from Paint to cutting mats. 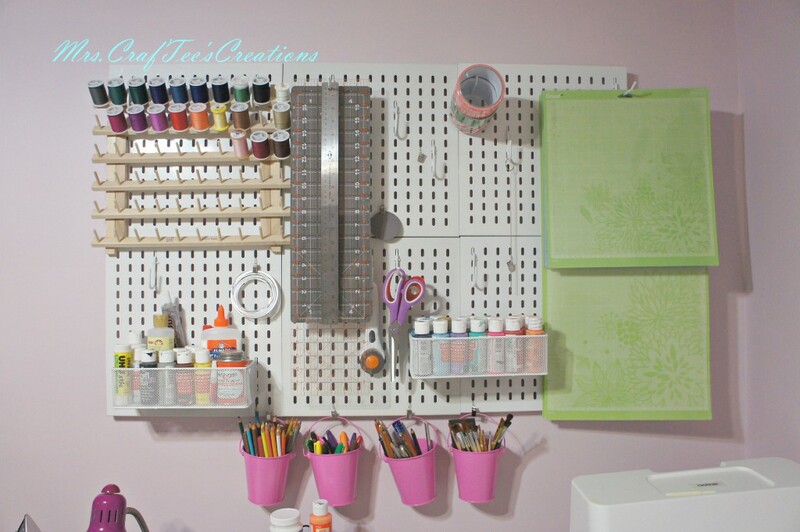 This is the Recollections white metal pegboard set that can be found in Michael’s Craft stores. It’s fairly expensive, but if you know me I did not pay full price for it. Michael’s has sales quite frequently. So, I just waited for the sales and hoarded coupons. There are always 40% off coupons on the Retail Me Not app or any other coupon service. There are certainly less expensive options when it comes to choosing a pegboard display. I just like the look and sturdiness of this one. So I was willing to spend a little more on this part of the craft room. Because the room is rather small my biggest concern when planning out the room was having enough space to store all the treasures I had and ones I plan on acquiring. It actually turned out to be the opposite! I have so much storage and not enough things to store. I feel like it makes the room look kind of empty at times. After careful consideration and looking at others ideas for storage in small spaces I settled on bookcases. I have a total of 6 bookcases in this room. Four of which were mentioned earlier in this post as the foundation of my two desk. The other two are 5 shelf floor to ceiling massive bookcases I acquired via Craigslist. To help tie them into the room I added a pink and white backing to them. I found this contact paper in Target’s Dollar Deal section for $3 a roll. I don’t think it gets any better than that……or cuter for that matter! My favorite piece of furniture in the craft room is my fabric storage. 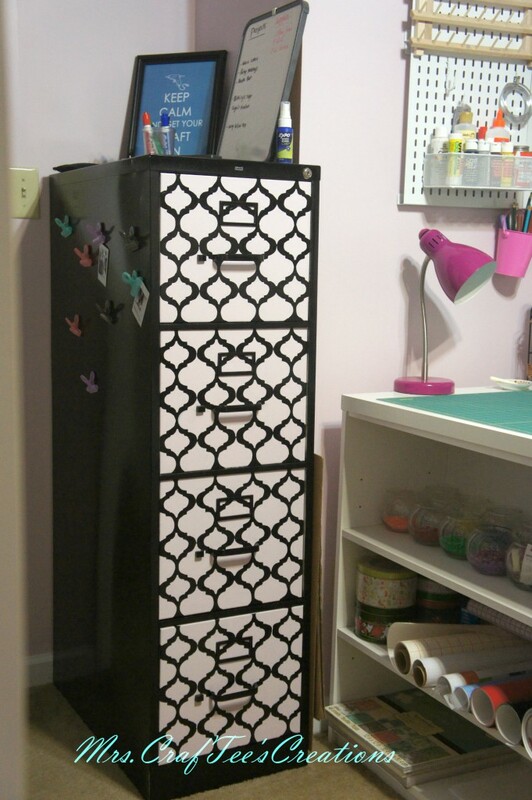 It is a 4-drawer black filing cabinet adorned with a quatrefoil print on the front. After getting a bargin for the old black filing cabinet off of Craigslist for $35 I gave it a little make over. A new coat of black spray paint and then I stenciled on the pattern with the extra paint left over from painting the craft room walls. 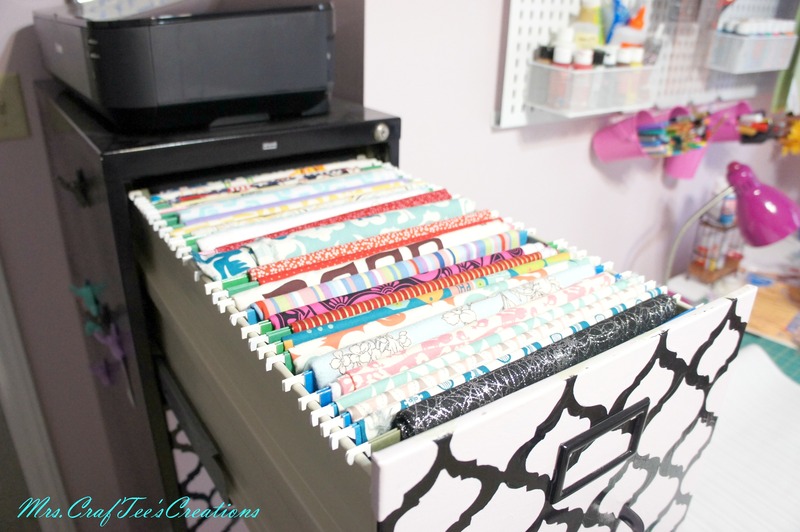 This was a genius way to store fabric I came across on Pinterst. Here’s the inside. For extra added storage and to organize my storage I recycled some Hammermill copy paper boxes I got from work by covering them with fabric. I love them. They are pretty cute and easy to make! There will be a post on them soon. Well, there you have it! The place I go to get away, my creative oasis. Organized and neat for all the world to see. Who wants to put in a bet to see how long it last? I’m going to give it a week! Thanks for taking my craft room tour!! Awesome, you sure know how to give a room a pop! Thanks so much Kierra! You are the sweetest!